Pressmark with a WordPress installation with all you need to start a social bookmarking website (like del.icio.us, sabros.us, …). Pressmark includes WordPress Prologue theme, which has been used by WordPress team to have a twitter-like dev-blog. Prologue include Gravatar support, so go to upload your avatar on gravatar.com to have a nicer output! If you feel like adding your own modification to the code, you can clone/fork the project on Github: http://github.com/alx/pressmark/. All contributions will be welcomed! WordPress configuration: copy ‘wp-config-sample.php‘ to ‘wp-config.php‘ and fill up the MySQL database information. After first days with the Darwin machine, it became clear that something was needed to replace the current Arduino software and upload the RepRap firmware directly from Textmate. You can clone/fork the project from Github too, make your own repository and I’ll be glad to add your patch to the current simple bundle. And come back during the week, you’ll surely see some update during the intensive RepRap hack session! On the way to launch Live ClÃ¶thing, I had to hack this morning the register action hooks for WordPress, that don’t work as simply as excepted. Great news today for RepRap at Las Indias: the mechanical machine has just been ordered from BitsFromBytes, and it should arrive in Madrid in 3-4 weeks. Fully assembled and tested, in a wooden crate for easier transportation, I’ll hope to have the time to make some demo at the end of the month. experimenting: we’ll need to melt stuff then, and see how it reacts. Faboroni, another fabbing project, has made a recent experiement with various cooking material (chocolate, cheeze, …). And I’ll need to find a source to buy some plastic polymers, or make our own. Then, will it be possible to plug your wiimote in RepRap? 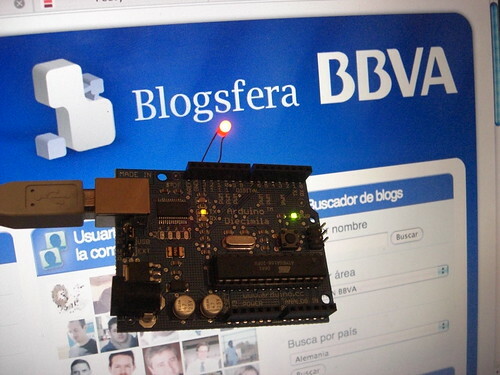 After a lot of debugging on bbvablogs.com, I needed serious fun to keep it up, and suddently I found the perfect project to remove the dust on my arduino board: a blinking led that would tell us when someone is visiting the website! Because the last version of WordPress-mu is quite new, there is no proper plugin to start using new tag system available with WordPress 2.3 system. For more updates, please follow the Mu Forum thread about this hack. One of the interesting part with Twitter is its worldwide use. On my Twitter, I usually get European twitts at the end of the afternoon, and South-American twitts during the night. Comparing my twitting habits with those of my friends, each one of us could have a twitting timezone, that we’ll be surely different even if you live in the same ‘real’ timezone. It could be easily done using the API, unfortunatly, Twitter reduce the API use to one request per minute, so it’ll take one hour to build such a timezone with all your 60 friends… but I’m pretty sure someone will have fun to do something like this soon. After a first try with tiny space between LEDs (see last post), here is another try with enough space to build a proper cube, still following MakeZine instructions. The fun parts were to add transistors to the board, allowing to get more power for each led level, and the programming: Persistance-Of-Vision and binary manipulation for led on/off switching. 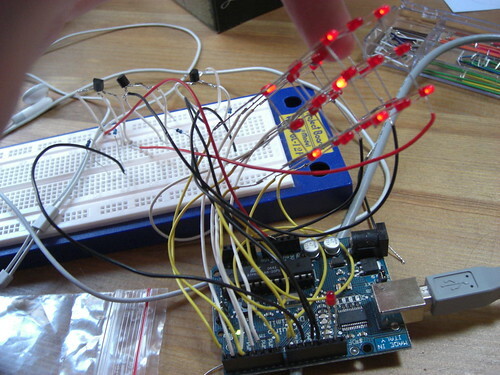 If you need it, you can download the arduino program related to this circuit. The original project for tonight was to build a 3D LED cube, and the not-so-clever idea was to compact it the size of a normal dice. Big mistake: first it was hell to solder all the tiny intersection of led cathods, then there is no way to pile up the array of leds if you don’t let space between them… maybe there’s a solution to that, and I’ve not find it yet. 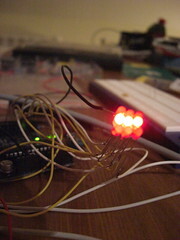 Anyway, it was ready to connect to Arduino board, and to try to program this new led-matrix. Easy and fun, only problem is debugging messages while verifying source code on Arduino software that doesn’t help much, I’ll have to learn more about its syntax limitations.